If I could freeze time and forever keep my kids little, I wouldn’t even hesitate to do so. I love the squishiness of their little bodies and the wonder that they see in everything. I love holding them and feeling the way that they just melt into me. I even love the way that they are still dependent upon me for so many things. I won’t even pretend that I’m one of those moms who eagerly awaits the first day of school, sleep away camp, proms, graduations, and weddings. I’m the mom who truly mourns the end of babyhood and toddlerhood and I’m often in complete denial that my children are getting older. Katie's bed as it was when we brought her home from the hospital and as it still is. Yep, our three-year old still sleeps in a crib (and yes, we still use a video monitor on her). I’ve often joked that we were going to keep her in her crib until college. And while that’s clearly an exageration, we did plan to keep her in her crib until Matthew was sleeping through the night, as we thought it would be easier to handle one nighttime challenge at a time. Well, that day has come. Matthew’s been consistently sleeping through the night for a few weeks now. How will we make sure she stays in her bed? Will our great sleeper suddenly start waking in the night? Will she wake us up at say, 5:00 am, by standing at the side of the bed and giving me a heart attack? Although my worries are plentiful, I’m beginning to feel that the list of benefits to her being in her own big girl bed is growing longer. And as much as I dread the switch, there’s also a tiny part of me that is eager to see her face as she realizes that she’s being given a bit more independence. There will be tears…and they will all be mine. If any of you have any tips on how to make the transition go smoothly, I eagerly welcome them. Don't be sad about it! Look at the bright side – all the fun pre-school stuff you are about to experience! Although, the bedroom and crib – absolutely adorable! Oh yes…the dreaded crib to bed transition! We moved my little girl just before she turned 3. We made a big deal about it…really played up that she was getting a big girl bed and that she was now officially a big girl. With being a big girl came big responsibilities. We laid out that she was now responsible for picking out her jammies for bed, tucking her friends (stuffed animals) into bed and keeping herself in her bed once she got in. The first few nights were a little bumpy with the actual going to bed. She'd sneak out and come to see what we were doing. We just remained consistent with walking her back to bed and reminding her that she had big girl responsibilities and one of them was keeping herself in bed. After about a week she stopped getting out of bed. Then about 2 months later, she started coming into our room in the middle of the night and I made the mistake of letting her crawl into bed with us. After about a month, we totally bribed her with a Disney Princess scooter. We told her that if she could sleep in her bed all night for a month, we would buy her a scooter. She hasn't gotten out of bed since then. And yes, there will be tears…I cried like a baby the first night we put her in the big girl bed. Good luck and sorry for the long comment. If the crib doesn't bother her and she isn't asking for a big girl bed, I say let her stay in there! She doesn't try to climb out? My son was a monkey…so he transitioned to a big boy bed at a year old! The twins are still okay in their cribs, and I'm leaving them in there until they try to climb out!! The switch to toddler beds didn't bug me too often, but they did that shortly after I became Mommy Beth. I do, however, have an issue currently with the pending switch to booster seats! I'm almost glad they haven't arrived in time for vacation, I'm not ready for it! We moved my daughter to a big girl bed when she was 3-1/2. I'm not going to lie – it's when she stopped napping. Not completely, but regular naps ended. But we did tell her she was not allowed out of her bed. She's over 4 now and still screams for us in the morning to come get her. I don't have any transitioning experience yet but I just wanted to say I'm glad I'm not the only one who still uses a monitor. It's not a video one but it's the motion sensor ones and I know the risk of SIDS is no longer an issue but it gives me such peace of mind to have it on every night! My boys are 4 & still take naps. We've been through cribs to toddler beds and toddler beds to twin beds. And I still use a baby monitor in their room! The Mook got her big girl bed at 21 months when her dad and I split and he kept the crib. For the most part, I didn't make a big deal about it. At the time, she and I were sharing a bedroom at my brother's place, so that probably made the transition easier. And yes…she will scare the crap out of you one day, as you open your eyes to find a little person inches from your face. The Mook used to call to me from her room, as if she'd forgotten that she could get herself out of bed and come into my room. Now, most mornings I wake up with her in my bed, where she's joined me sometime in the early morning, but as long as she keeps her knees and elbows to herself, I'm alright with it. It helps, tho, that I've got a double bed all to myself. Next…toilet training! Fun times ahead, promoting the whole 'such a big girl' stuff! Oh, and for the record…The Mook will be 5 in October and still naps. I call it "quiet time" and it happens on the weekend when afternoon rolls around and I know that we BOTH need some time to ourselves (we are skilled at pushing each others' buttons). She's supposed to be quiet and stay in her bed, but she's not required to sleep. She usually has some snuggle toys to play with and some books to "read" while she's laying down. And I usually have to remind her several times that singing is not part of Quiet Time. Even if she doesn't sleep, I find the "resting" makes a big difference. It helps that her daycare has the same sort of period post-lunch in her JK/SK room. On Canada Day, she had quiet time that turned into a 3-hour nap, which made very-late-night firework watching so much easier. When I packed up the crib after Kallan was done with it? I cried and cried and cried. And the rest of my family? Stared at me in horror and shock. It was such an end of an era. Everybody else? Moved right along. 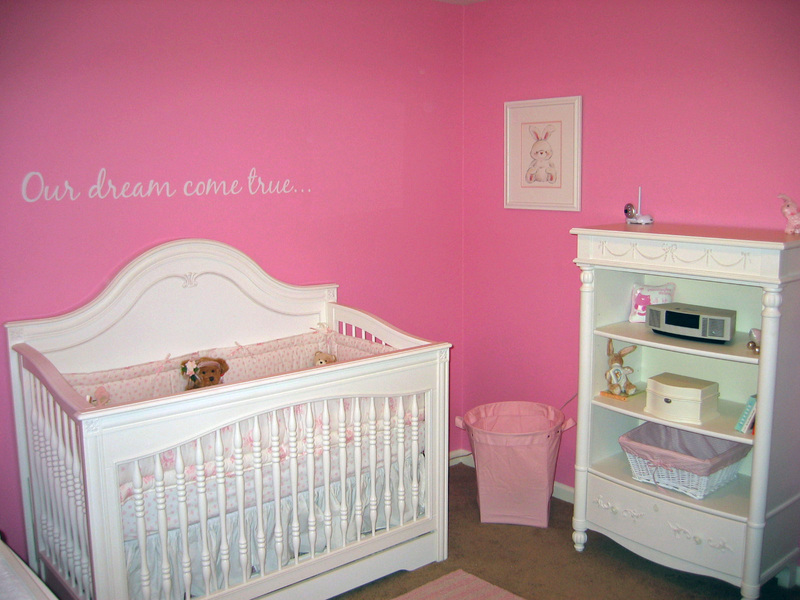 I love the wall saying above her crib – just adorable! My cousin used to climb out of bed to wake her mom and tell her she loved her at 3 am. While terrifying, it's still pretty sweet. So maybe you've got that? Thank you…we love her room. When we first had her room painted, I, in my hormonal overload, cried and cried. It was SO pink. But, once we added the furniture, I fell in love with it. The best part? She adores her room and it makes her so happy. I love the idea of telling Katie that it is her responsibility of keeping herself in her bed. That is golden? She'll totally go for that. And when all else fails, a princess scooter is a pretty fair trade, isn't it? As much as I'd love to keep her in the crib, she just seems ready. I am always holding her back…I spoon fed her for ever (there are still nights when she'll ask us to and we say no!). Do you mean booster seats in the car or the at the table? Booster seats in the car scare me…that's like admitting that you have a big kid. Not gonna happen! No booster seats 'til college is my motto. I'm thinking that we'll tell her that when the first number on her clock is a 7, she can call out for us, but NOT get out of bed. Overall, she's pretty compliant, so I'm crossing my fingers for no middle-of-the-night visits. Only problem is when it goes off for no reason and my heart stops completely. And the video monitor will stay in position till college, as it will probably be most handy when she's in high school! I didn't have a hard time when they moved to beds, but I was weirdly un-thrilled by potty training. I have to do everything backwards. But I so know what you mean. I want to keep them close to me, keep them little and sweet. Turns out? I was right to want that because teenagers don't smell very good. All three of our older kids napped for a looong time after they moved out of their cribs. I'm glad to have found your blog. I followed Lori over for her guest post and I am enjoying reading. I'm quite sure you've already begun transitioning and I hope it's going smoothly. I've transitioned mine at a much younger age because of the addition of a sibling, but I've never had much trouble. The key is to be consistent and let them know what you expect and then sticking to it! Good luck!